E. Rawls, a dear #BlogBattle and Author friend nominated me for this tag! This is a new one for me. 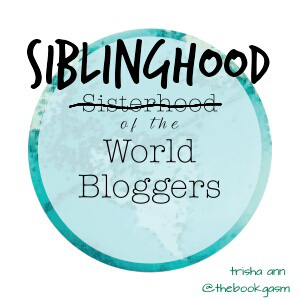 It’s reminiscent of others, but I like the idea behind “siblinghood.” Sometimes the bloggers I get to know the world over become like family to me, so it’s cool. Write in the morning or late evening? I’d rather write in the morning, but most often I only find the time to truly concentrate during the evening (except when the kids are in school!). Dog. We got a dog back at the end of May! Her name is Hashtag and I LOVE her even though she’d kinda crazy. I’m allergic to cats, but sometimes their personalities amuse me. Fly like a bird or swim like a mermaid? Mermaid. Always wanted to try that out. Moderate isn’t an option? I’m more acclimated to cold weather, so I guess I could live with that. I always say it’s easier to put more clothes on; it’s much harder to take more clothes off at some point. Visual, auditory, or kinesthetic learning style? I’m a combo learner. When I was tested back in the day it was visual/auditory. I do best when I write down what I’m hearing. It gives me the visual along with what I hear. Of course, that’s almost akin to kinesthetic, isn’t it? Personality wise, I’m middle of the road, too. I’m more extroverted than introverted, but only by a small margin. I believe I’d fall into that Divergent group if ever I lived in the dystopian world of the book by the same name. ha! Action movie or funny movie? I like funny action movies, such as almost any Jackie Chan flick. But if I could only choose one or the other, I do like action. I can laugh at pretty much anything, though. You only have two choices, would you rather . . .
Watch a movie at home on your own couch or go to a crowded theater? Write about flying monkeys from outer space or an ill-fated love turned tragedy? Dance hip hop style or waddle around like a duck? Tell your mother you broke the cookie jar or blame the dog? Eat pickles with chocolate ice cream or sardines on marmalade toast? Walk backwards for one-hundred miles or have someone yank on your ear for three hours? Tell someone the truth even when it’s hard or lie to them to avoid conflict? Base jump off the Empire State Building or rock climb in the Grand Canyon? Kill the bear or be killed by the bear? Be a DC or Marvel superhero? I know we just met so it’s a bit rude of me to say but you’re kind of evil. I mean, really, these questions… And the “only two choices”… And the questions… I’m beginning to think you enjoy torturing people. 😉 This should be interesting. P.S. I could have written your book answer. Also, mermaids are AWESOME! Seriously, you’re so rude! No! I’m just kidding. haha 🙂 Thanks, I totally take that as a compliment and love that you said it. 😀 I think there is a little bit of a torturer living inside me. Otherwise, how could I write? haha I can’t wait for your answers. 😀 yay for hardbound books we love! You’re a Divergent! *sounds the alarm* *epic chase* 😀 Haha, I’m somewhere in between too; really depends on the situation and the people. I was torn. Would be nice to fly, too, but I harken back to my days of loving The Little Mermaid and, well, there you have it. Flying fish sounds fun, though! Now I’m looking forward to your flying monkeys in outer space story. You’d better get busy. GLUTEN allergy are stinky. sorry. Oh my dear, you made my night! 🙂 Thank you for the nomination and I’m so glad we met! 😀 I’m so pleased to hear it! You are welcome and thank you! I’m glad we met, too. Does WP tell you when I link you? They don’t tell me…whoever they are haha! If the link is a good url then it will give me a ping back to let me know you linked to my blog. Sometimes I think they have glitches, though, and it doesn’t notify me! If that happens and you don’t hear from me or see a response it’s probably because it didn’t work for some reason. 🙂 It certainly would be! Thanks. If you were a mermaid, what’s the first thing you would do?